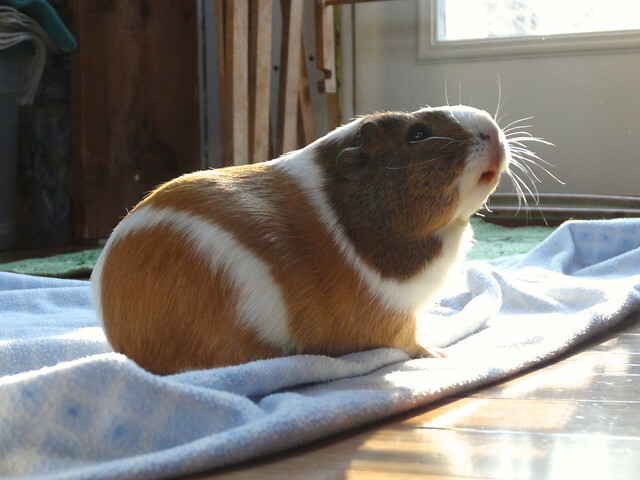 One of the difficult things about this past winter was that our darling guinea pig, Annabelle, was ill. One day in early January, we noticed that she was barely eating or moving and that she was in obvious distress, but we could not see anything wrong with her. 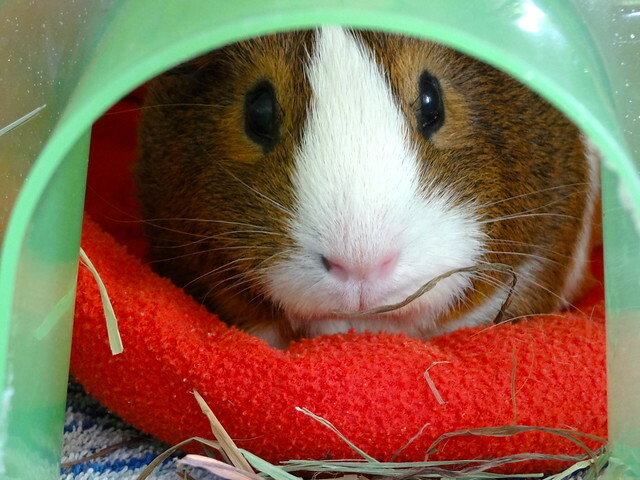 Still, knowing how quickly guinea pigs can decline, we rushed her to our wonderful vet, nearly two hours away. 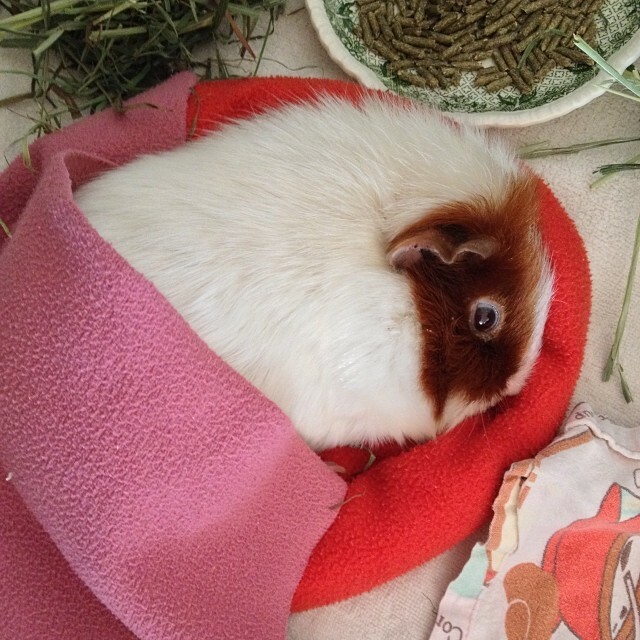 After a lengthy and puzzling exam, we all began to notice swelling on her right haunch. 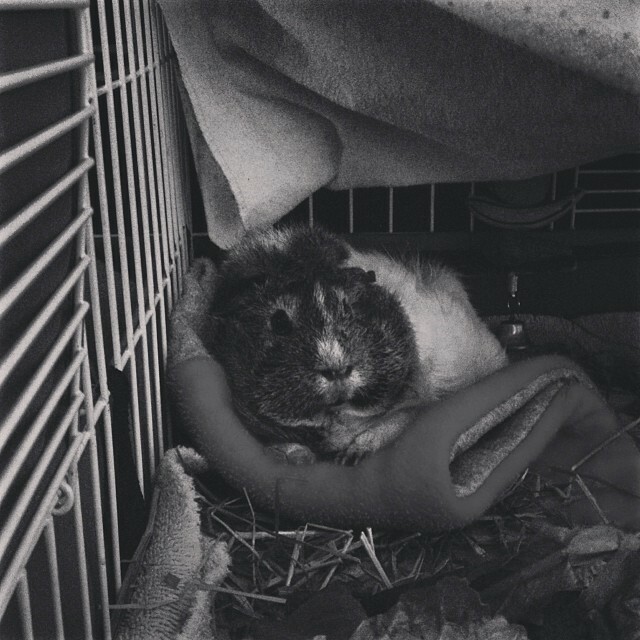 Two x-rays later, we were told that Annabelle likely had osteosarcoma, a rare (especially for a guinea pig not even four years old) and aggressive bone cancer and that our time with her was limited. The cancer had broken her leg bone in two places. Our kind vet said she would consult the other vet in the coming days, but encouraged us to return home with Annabelle and say our goodbyes and come back a week later to have Annabelle euthanized, as there was not any reasonable treatment that would help her. We were heartbroken, of course, and so we did just that - we took her home, administered her pain medications and water by dropper, and made her as comfortable as possible. Probably due to her pain meds and much needed water, she began to perk up. And she began eating. Not just eating, but eating everything. She was alert and seemed her usual, content self. 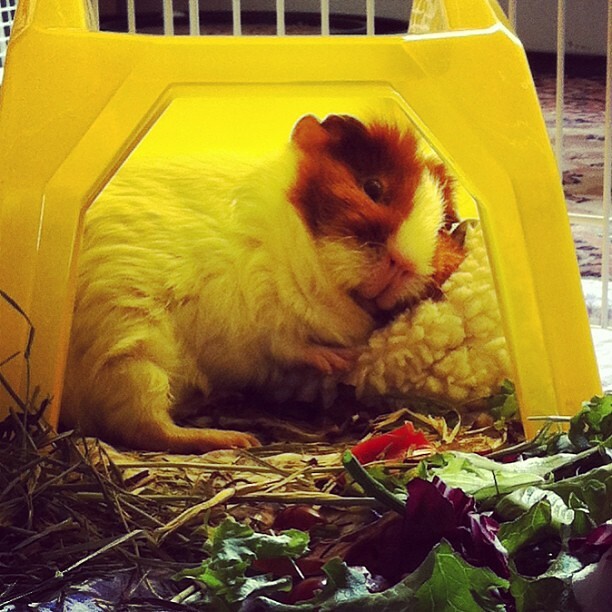 So I called the second vet, the one with the most guinea pig experience, and spoke to her. 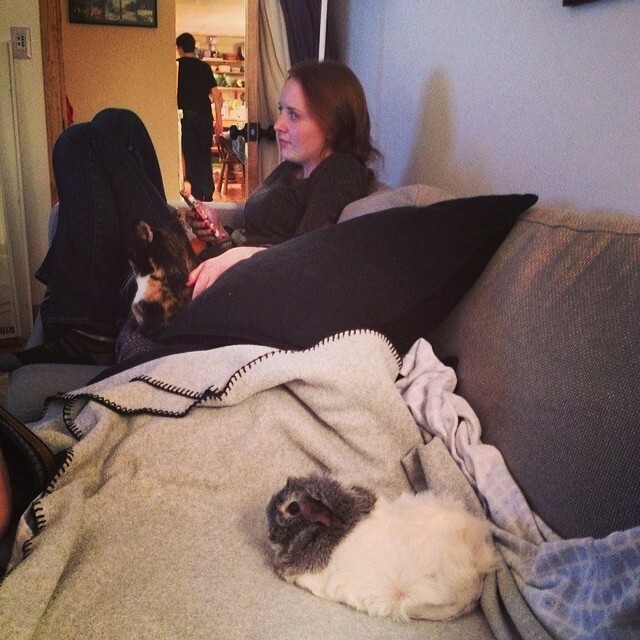 She said that she didn't think Annabelle had osteosarcoma (again, a very rare cancer for guinea pigs) and she certainly didn't need put down. Our vet said she thought that yes, her leg was broken, but the mass seen on the x-ray was most likely tissue forming around the break, and that Annabelle's body was trying to repair the injury. Why was her leg broken? We have no idea. 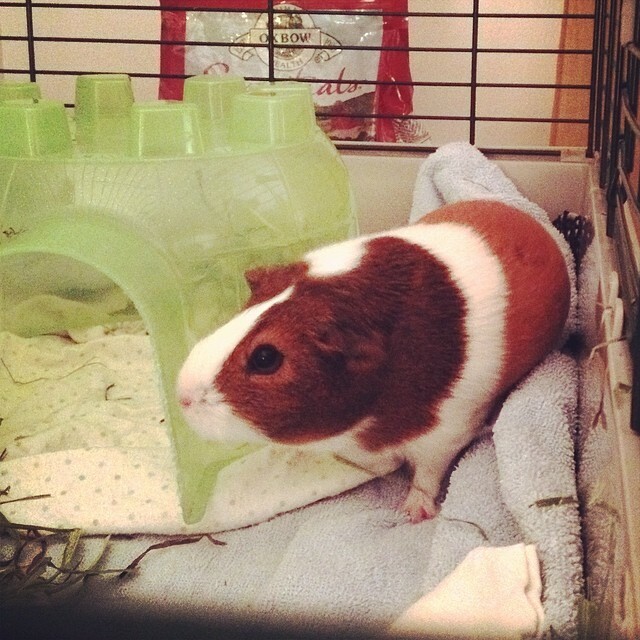 Guinea pigs have tiny, toothpick-like bones and they are easily injured. Sometimes all it takes is tripping on a toy or catching the foot under a food bowl or house to cause injury. 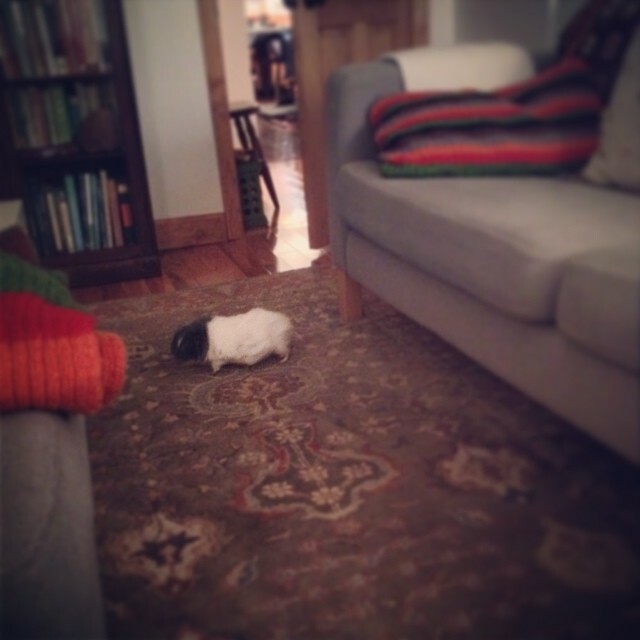 Another, larger guinea pig (her roommate Beatrice) might have stepped on her leg. All we know is that there must have been some accident. 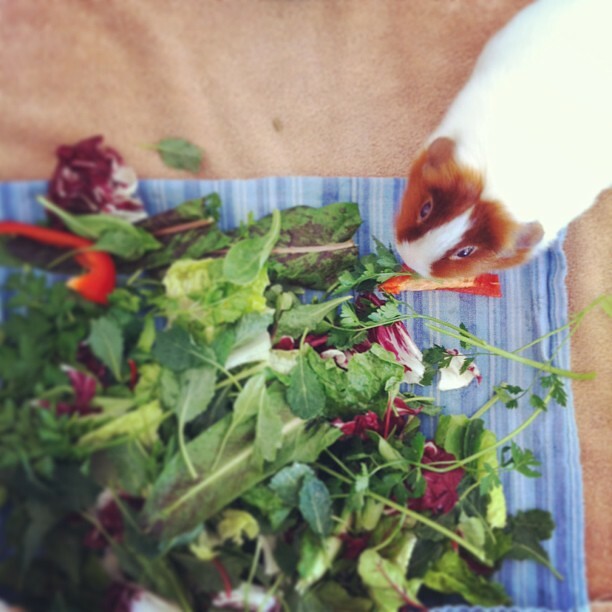 The vet mentioned Vitamin C deficiency, which is certainly a concern with guinea pigs, but as ours eat two fresh salads a day and have loads of veggie snacks in between, we're not convinced that was the issue. However it happened, it happened. So for the rest of January, Annabelle was on pain meds and an antibiotic. We gave her her own habitat away from Beatrice, first dividing their pen, and then later we moved Annabelle to her own space. Both were sad, but less so when they couldn't see each other. If they could see each other, Beatrice would pine for Annabelle, and Annabelle just became agitated. Poor dears. We hated to separate them, but it was necessary. Annabelle has recovered and does not have cancer, though she is still stiff and not anywhere as mobile as she once was, unfortunately. This also means she and Beatrice still have to live apart, as we do not want Beatrice to accidentally hurt Annabelle with her uh, enthusiasm. And that's how things were until last week. 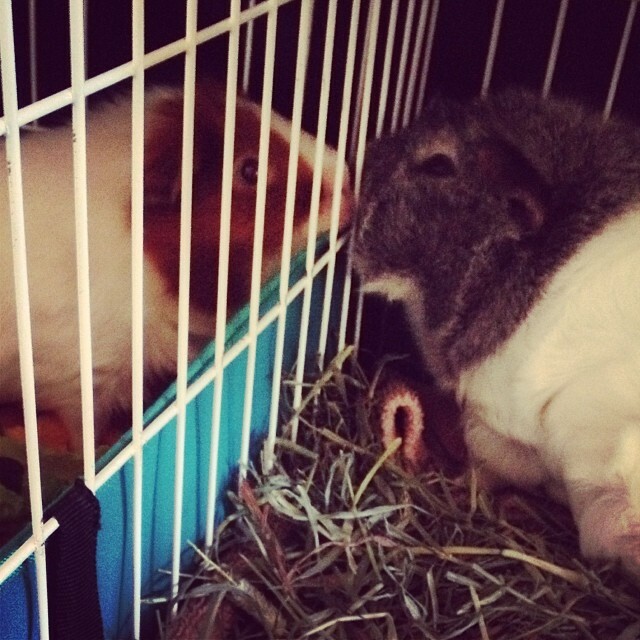 We had two middle-aged guinea pigs living in separate habitats, who occasionally saw each other through a partition in the play pen. 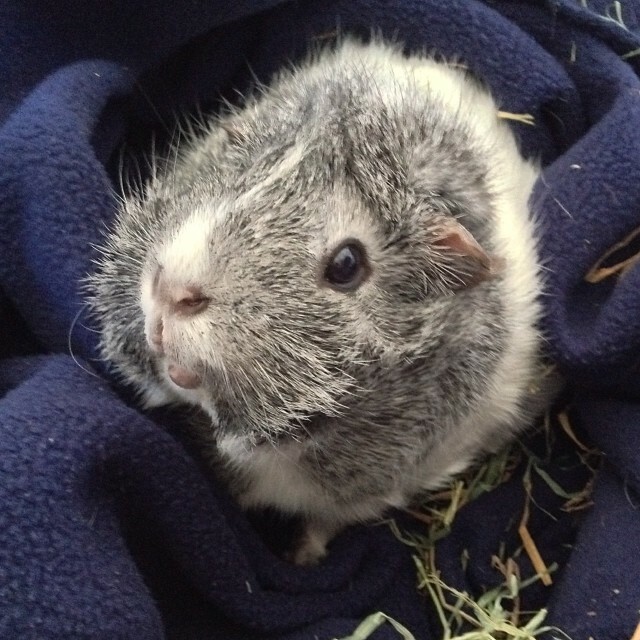 Then last Wednesday, a friend let me know about a mutual friend who needed to rehome a guinea pig because the mutual friend's son seemed to be having a severe allergic reaction to it. 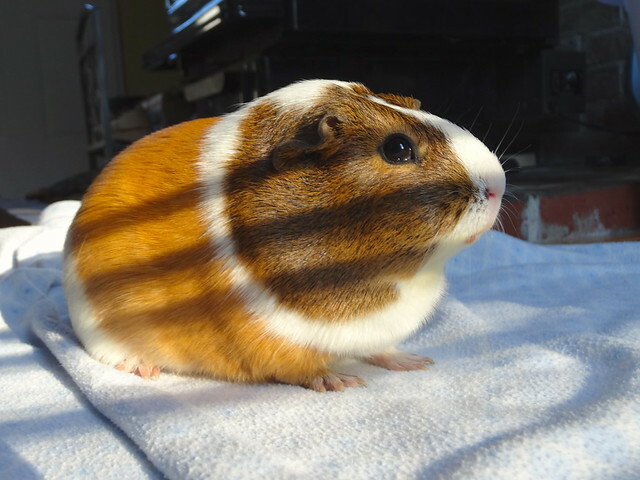 They had only had her for a ten days or so and hated to do it, but were really hoping to find someone to take the guinea pig instead of returning her to the shelter. 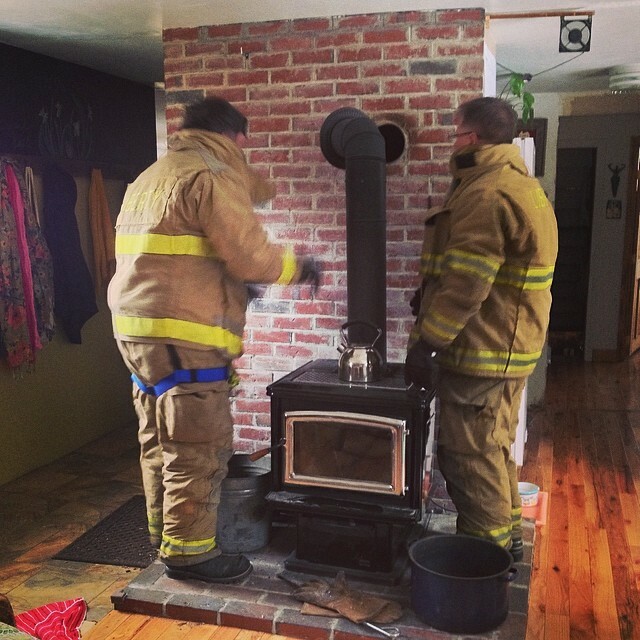 So because it was a friend, and because we knew she was in a tough situation, and because it had already been a completely random day involving high winds and a 911 call to the fire department to come look at our wood stove because smoke was filling the house (everything is fine, there was no chimney fire, it was the wind that had knocked the pipe loose from the wall and now the cats hate me for stuffing them into duffel bags to evacuate them from a potentially burning house), we found ourselves on country roads to meet a friend about a guinea pig. Meet Claudia Rose. She came with the pretty name "Rosa", but we wanted our own spin on her name, so now we have A, B, C. Annabelle, Beatrice and Claudia. 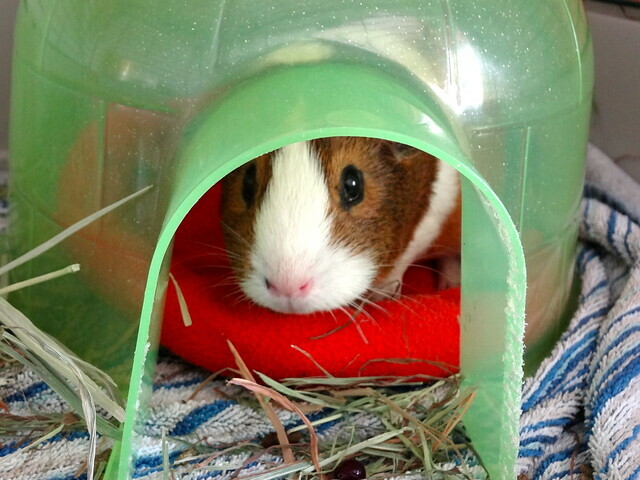 She is very sweet, though shy, as she is still getting to know us. Annabelle is back living next to Beatrice is a divided habitat (which seems to be alright for now) and Claudia has her own cage until her quarantine is over. We were told that she is 8-months old. She has pretty, dark eyes, is soft and lets us pet her and pick her up. 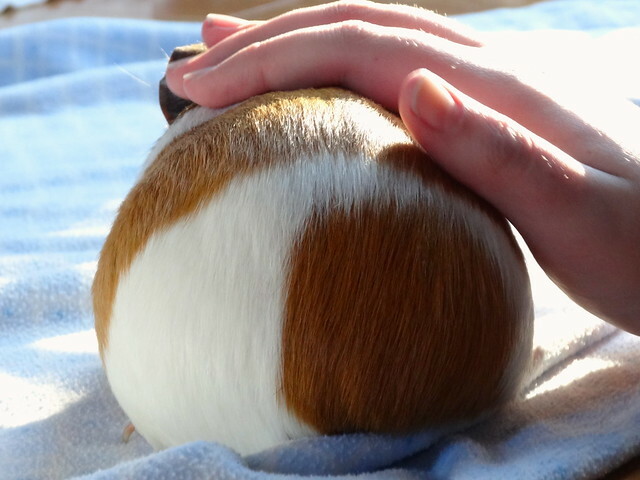 And look at that little guinea pig tush! Weirdly, she only eats hay, pellets and carrot. Nothing else. 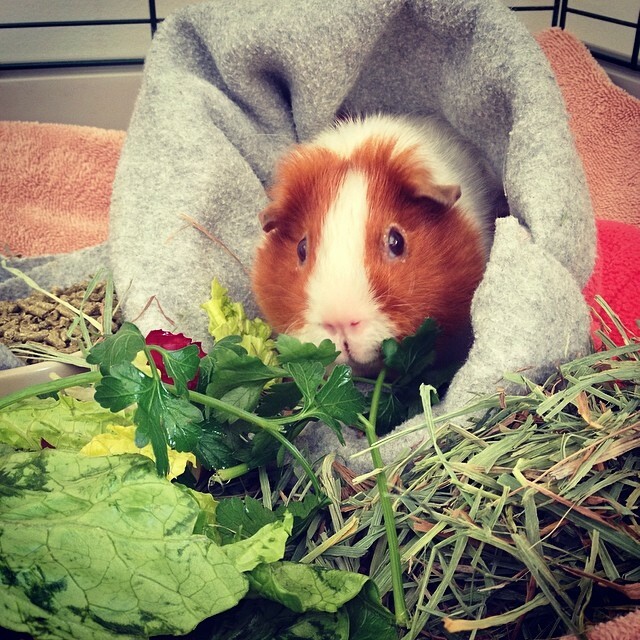 We always offer greens, but so far, she has not taken us up on our salads. I hope that someday when we have an actual spring, she will find dandelion and clover irresistible. Meanwhile, we are crossing fingers that it is her carrot diet that has made her plump and that she wasn't adopted from the shelter, pregnant. Yikes. 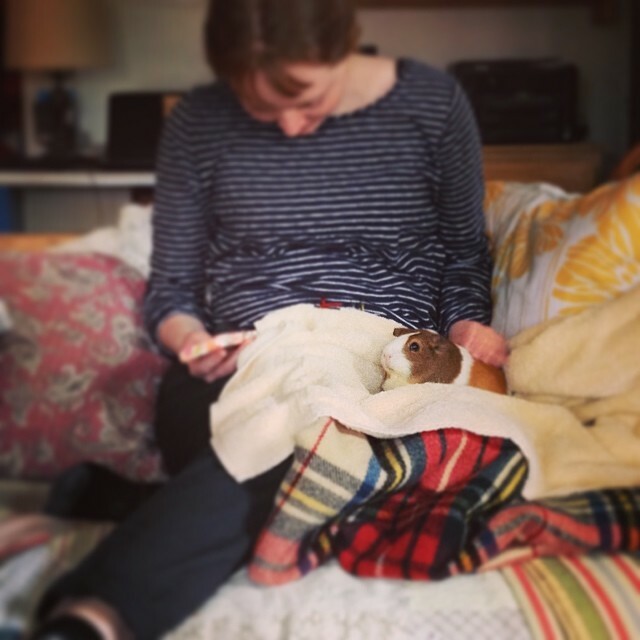 (Not so much because extra guinea pigs, though obviously that's not desirable, but because pregnancy and birth for guinea pigs past six months is potentially dangerous if not impossible because their pelvic bones fuse together.) We will simply have to wait and see and hope that she begins to like greens. I have been following your blog for many years already and have never commented before. I love the way you share your life and home and world with readers. Thank you!